A beautiful, sparkling smile communicates confidence and health. At Saco River Dentistry, we want to help you achieve the smile you’ve always dreamed of. Our extensively trained Buxton cosmetic dentists offer a comprehensive range of state-of-the-art aesthetic treatments. These procedures are designed to enhance the beauty of your smile, and each one will be customized to suit your needs and goals. Not sure what the best option is for your desired outcome? We can provide guidance based on an evaluation, and collaborate with you to find an ideal approach. Our team is dedicated to giving you the best experience possible. For more information about our cosmetic dentistry options, please follow the links below. You can also contact us to learn more or to schedule an appointment. Porcelain dental veneers, more commonly known as cosmetic veneers, can help address a wide range of concerns, including chips, cracks, gaps, and staining. Our team can help you achieve the smile you’ve always wanted using a conservative approach that preserves your oral health. Bothered by stains? We offer advanced teeth whitening treatment, which can brighten teeth by multiple shades with just a short in-office procedure. We take care to protect sensitive gums and to give you the best experience possible, and we offer helpful tips to maintain your results longer. Straighten your teeth more comfortably and discreetly than ever before with the help of Invisalign clear braces. This innovative technique uses removable aligner trays to gradually shift the position of your teeth without the need for metal or wires. Also known as a “Smile Makeover,” Smile Design from our practice is a multi-purpose approach that mixes and matches cosmetic techniques to suit your preferences. If you have more than one concern you would like to address, such as stained teeth, chips, gaps, and/or crowding, for instance, our dentists can recommend a selection of options to correct them. When combined, these treatments can provide more comprehensive improvement than a single procedure and help you achieve the results you’re after. Smile Design begins with an in-office evaluation. Our dentists will sit with you and discuss your concerns, talk over your likes and dislikes, and answer any questions you may have. They will also perform an evaluation and develop a customized treatment plan based on your initial consultation. Every stage of the Smile Design process is personalized, and if you would like to add any other dental services, we typically can modify the procedure to include them. Just let us know! Cosmetic bonding, or composite bonding, as it’s sometimes called, is a technique that can improve the appearance of a number of dental concerns. In this treatment, minor stains, gaps, chips, and misalignment can be concealed by applying a composite resin material to the affected tooth or teeth. In some cases, a small amount of enamel may need to be removed to achieve the best result possible. This minimally invasive approach can be very cost-effective and usually can be completed in a single visit; however, it’s not appropriate for everyone. 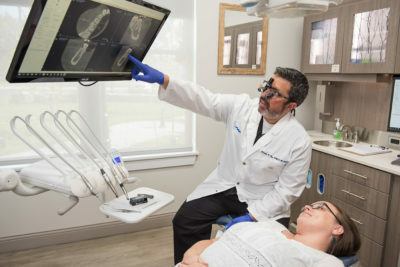 One of our dentists can provide more information during your initial consultation and help you determine the right technique for your needs and goals. Still have questions? We’re here to help. Contact us today at (207) 929-3900 for more information or to schedule a consultation with one of our Saco River Dentistry doctors.